know about Mugwort botanical description, medicinal properties, medicinal uses in Ayurveda, It’s health benefits, dosage, contraindications and side-effects of different parts of this plant. Artemisia vulgaris, commonly known as Mugwort is a perennial medicinal plant. It is native to Asia and North America and found throughout the hilly regions of India upto 3600 m in the Western Himalaya, Sikkim and Khasi hills. Mugwort is used as a folk medicine for delayed or irregular periods, intestinal parasites, vomiting, indigestion, stomach ulcers, epilepsy, convulsions, burns etc. The roots are used in combination with other herbs for psychoneurosis (feelings of anxiety, obsessional thoughts, compulsive acts), neurasthenia (fatigue, headache, and irritability, associated chiefly with emotional disturbance), depression, hypochondria (health anxiety or illness anxiety disorder, refers to worry about having a serious illness), general irritability and restlessness, insomnia and anxiety. Mugwort is an appetizer, spice, stomachic, deobstruent, neurotonic, antispasmodic, anthelmintic and stimulates bile function. Externally, it is used for fomenting ulcers and certain skin diseases. Artemisia vulgaris is perennial, shrubby, aromatic plant. The plant is a long-stemmed, 70 to 150 cm high with a branched, many-headed and creeping rhizome without runners or rosette. Shoots are slightly, pubescent, often red-tinged and have a weak unpleasant smell. Leaves: Ashy and tomentose beneath, lower pinnatifid, upper trifid, tippermost undivided or with lanceolate lobes; lobes of the lower leaves toothed or cut. Flower: Flower heads ovoid, 3 to 4 mm long by 2 mm wide; Numerous flowers are short stemmed, erect or slightly drooping. They are in dense heavily branched panicles with numerous lanceolate bracts. Bracts downy white with a green midrib; Inner bracts lanceolate and acuminate; Outside ones oblong and obtuse with broad membranous margin; Flowers yellowish or red-brown and almost glabrous; Inner flowers androgynous and outside are female; Receptacle glabrous; Fruit has an indistinct margin. Distribution and Habitat: Throughout the hilly regions of India upto 3600 m in the Western Himalaya; Sikkim and Khasi hills upto 1500-2400 m.
Soil: Any moist soil. This plant is considered a weed and can be found in ditches, in waste places, or along roadsides and fences. The Sanskrit name of Artemisia vulgaris is doubtful. It is known by different names in various states and texts. In Northern India and Bengal it is identified with the Nagadamani. Another plant Crinum asiaticum (Sudarshan, Spider Lily or Grand crinum lily) is also known as Nagadamani. In Southern states, this plant is known as Granthiparni. The botanical name of Mugwort is Artemisia vulgaris. It belongs to plant family Asteraceae. Below is given taxonomical classification of the plant. Artemisia vulgaris L. var. glabra Ledeb. Artemisia vulgaris L. var. latiloba Ledeb. Artemisia vulgaris L. var. selengensis (Turcz. ex Besser) Maxim. Mugwort mainly contains a bitter substance, and a green volatile oil having a camphoraceous odour. . The roots contain a volatile oil in addition to inulin, tannin and resin. Artemisia vulgaris is rich in medicinal properties. The understanding of these properties will help us to better utilize this herb. These also indicate the conditions in which we should avoid it. For example, it has abortifacient and emmenagogue action and due to this it must not be used during pregnancy and also by a woman suffering from heavy periods. Antianxiety: tending to prevent or relieve anxiety. Antiemetic: Useful in the treatment of vomiting. Antilithic: Preventing the formation of calculi or promoting their dissolution. Deobstruent: Removing obstructions; having power to clear or open the natural ducts of the fluids and secretions of the body. Nervine: Tonifying effect on the nervous system. Sedative: Promoting calm or inducing sleep. It stimulates bile secretion and thus supports better appetite and digestion. It increases peristalsis and thus gives relief in constipation. It is sedative and helps in anxiety, stress and mental agitation. It regulates the menstrual cycle. A strong tea made from the flowers and top leaves is thought to dissolve stones. Mugwort is used internally as tonic, deobstruent, febrifuge, and anthelmintic. It is applied externally as an antiseptic and discutient (disperses a tumor or lesion). It is prescribed in hypochondriasis, jaundice dropsy, gout, scurvy, hysterical afflictions, and gastrointestinal disorders. As a nervine, Mugwort is valued in palsy, fits, epileptic and similar affections, especially in persons of a feeble constitution. Mugwort is very much used for malaria due to the presence of artemisinin. The plant is chiefly stomachic, deobstruent and antispasmodic and prescribed as infusion and electuary in cases of obstructed menses and hysteria. In Ayurveda, Artemisia vulgaris or Nagadamani is described as one that promotes complexion and cures poisoning by luta (venomous spider) and sarpa (snake). For the medicinal purpose, the dried leaves, flowering top and roots of the plant are used. The leaf has a pleasant tangy taste and the roots are sweet and pungent. The infusion of aerial parts is given for menopausal syndrome and period problems. It is also beneficial to cool the digestive tract in fever management. The Decoction of 5 g of the aerial parts and equal amount of dry ginger is given as a warming tea for period pain. Leaf paste is applied externally. Juice extracted from plant is given. Fresh leaf juice is given twice a day. Leaf juice is given in dosage of 1-2 spoon with water, once a day. Leaf or plant juice is given for phlegm and cough in dosage of 1-2 spoon. The expressed juice is applied on the head. Artemisia Vulgaris 200C is a useful remedy for petit mal type of epilepsy especially in children and in young girls after fright or other violent emotions. It is also useful in cases where the epilepsy is worse at puberty and during menses. Leaf and shoot tip are ground in buttermilk. It is boiled and taken during the night after food. Juice of heated leaf is given. Plant is washed, crushed and given with salt. Leaf ground with garlic is given. An infusion is given 3 times daily. Usual dosage of tea is 20-50ml, 2 or 3 times daily. How to make the infusion: Take 1 teaspoon of dried leaves or flowers, or 3 teaspoons of fresh herb. Cover with 1 cup of boiling water. Steep to taste. 5 drops / 1 tablet / 10 globules, every 30 to 60 minutes (acute) or 1 to 3 times daily (chronic). 0.5–5 ml liquid root extract. Exact dose is dependent on various factors such as age, health, digestive strength, ailment etc. Sensitization through skin contact has been observed, very rarely. Mugwort may cause abortions or allergies. Symptoms of an allergy include breathing problem, rashes, hives, eye swelling, sneezing, lips swelling etc. Mugwort Oil is allergenic and may cause dermatosis. Drinking more than 1 or 2 cups can lead to symptoms of poisoning. It has sedative effects. Do not take more than recommended dosage. It may It stimulates bile secretion and thus may cause acidity, heartburn, acid reflux, dizziness etc. Do not use in case of hyperacidity, bleeding problem, inflammation of stomach, peptic ulcer etc. It interacts with anticoagulant medicine or aspirin and increases clotting time. It may have a drug interaction with antimalaria, antidiabetic medicines and salicylates. It has drying and diuretic effect. It may increase risk of bleeding. This herb is not suitable for the long term use. Mugwort has emmenagogue action and is used to induce to menstruation. 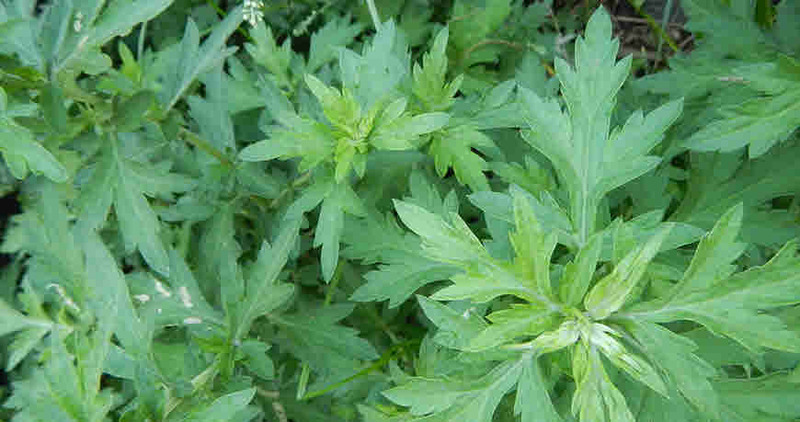 Therefore, the use of Mugwort is contraindicated in pregnancy.